Ijs.......she looks better than yall do on your best day. dem some old looking mid-twenty yr olds! I think that Lebron has a illness/disease that is aging him. Im dead serious too. Its working for him now, but in a couple of years we'll see. I don't wish that man no harm but maybe his hormones are overproducing or something. It hasn't hit him as hard as it did Greg Oden. 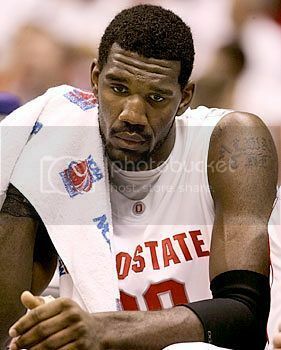 Greg Oden seriously looks like Lebrons Grandfather. Beyonce ain't got nothin' on me. [QUOTE=Sang Froid]I'mma let them turn 30 before I start worrying about them getting married. I don't check for LeBron like that but er, uh, I like his pants. A lot. I thought Lebron was older than jay-z, but I checked google and it says he's 27. his black cracks HARD. This is funny, because it is true. The truth is they are all slaves. well she did get pregaz, not once twice before she got engaged..
i'll address her or anyone in her predicament accordlingly AFTER she gets married. What is that under the see-through portion of Savannah's dress. Is that someonething on her skin or a part of the dress design?